Why Would Someone Visit Poland? Why would someone want to visit Poland? Janet and I visited Poland in 1985 when it was still communist. We smuggled Bibles, money and medicine into the Christians behind the Iron Curtain. Driving through the infamous Checkpoint Charlie into East Germany was a little bit hair-raising. While crossing between East Germany into Poland we held our breath. Everything went well but the oppression and the darkness and poverty was stunning. Now we lead pilgrimages through Poland and what was once dark is now light and colorful. Those who were oppressed and withdrawn are now smiling and bright-eyed—the Catholic Church that was tightly controlled is now in full bloom. Poland is the country of modern day saints. The pressure of the Nazis and the communists forged magnificent Saints and we walk in their footprints through their stories in their country. I cannot wait for this Poland trip this August! Poland has been on my bucket list for years and I cannot think of a better way of satisfying that list item than a pilgrimage with Steve and Janet Ray. Not only is Poland rich in spiritual and secular history but it was pivotal in the fall of Communism. My thanks to Steve and Janet for the opportunity. All of Steve and Janet’s pilgrimages are exceptional. This trip will be my eleventh (11th) with them. I would not do it any other way. We all know the story of Pope St. John Paul II and his heroic life and how he brought the Soviet empire to its knees. We follow John Paul II from his birth to his death. After a pilgrimage to Poland you’ll feel very close to the saint. The popularity of the Divine Mercy has swept the world and we will visit the convent of St. Maria Faustina to pray the Divine Mercy in front of her relics in the church at her convent. One of her Sisters will address our group. One of the most sobering moments of a pilgrimage to Poland is a visit to Auschwitz Concentration Camp. Here we’ll see the cell where St. Maximilian Kolby gave his life in exchange for a family man. Standing in the courtyard where the prisoners stood that day is very emotional. We will also discuss St. Edith Stein, the Jewish convert and Carmelite nun who died in these camps. The hotels, food, Catholic guides, buses and talks along the way only contribute to the glory of visiting this amazing Catholic country. Italy is another one of our destinations this year. But there are two things that make it unique from other trips to Rome. Many people have visited the Eternal City but we will be extending the trip outside to three other profound spiritual sites. First, will spend two days in the medieval city of Assisi. Here we will have a cooking class and we will also have a wine tasting with our Catholic guide, Liz Lev. We will also be visiting Lanciano home of one of the world’s most famous Eucharistic miracles with Mass in front of the stunning miracle. We will also celebrate Mass in front of the Facecloth of Christ at Manoppello. This is the face cloth that was on our Lord while he was in the tomb. My friend Paul Badde, the author of the bestselling Ignatius Press book “The Face of God” will join us and give a talk on this amazing face cloth. Liz Lev, the most “in-demand” guide in Rome and our great friend, will be our guide for this pilgrimage. There are special streets opened up for Christmas shopping for which we will have plenty of time. All the highlights of Rome are included in our itinerary. We will also meet with the Swiss guards and have a talk from their captain. Hopefully, you will be able to join us on one of these trips as we continue to explore and appreciate the great riches and traditions of our Catholic Faith. First, I want to thank John Grodelski and National Catholic Register for deeming my new book worthy of a book review. It was fair and balanced review for which I am grateful. You can read his review and my response below or here on my website documents page. The Review: The book’s subtitle captures its focus: what the pope does and why that’s important. While the book examines history — ours is, after all, a faith that is incarnate in time — its attention is not so much history as the role of the pope as Vicar of Christ. Divided into eight chapters, the book discuss the pope’s mission of governing, teaching and sanctifying. Other chapters treat a potpourri of subjects, such as how the process of picking a pope has evolved or 10 common myths voiced against the papacy. The chapter “The Pope as Gift to the Church and the World” provides brief sketches of eight popes, including 20th-century popes Pius X, John XXIII and John Paul II. The pope’s role in ecumenical and interreligious dialogue is the subject of another chapter. A final chapter summarizes the pope’s significance for Catholics as a sign of unity whose role is to anchor the Church’s faith and morals in truth. Brief appendices list all 266 popes and offer a short glossary of terms relevant to the papacy (like “cardinal” or “encyclical”). Similar sentiments can be said of his successors. 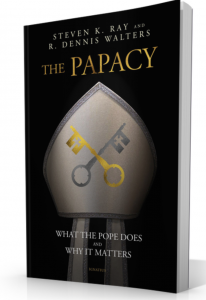 Readers wanting an overview of why the Church needs the papacy would do well with this book, which offers a basic, up-to-date and sympathetic treatment for today’s Catholics about the purpose and significance of the papacy. The book is clearly a starting point, which means it’s limited. The authors could have included something about how the Church teaches infallibly not just in the extraordinary but in the ordinary magisterium (see Lumen Gentium, 25). The authors rightly note the infallibility question is an essential part of the Church’s mission of bearing truthful witness to God’s will. Since that’s the case, the conditions for the infallibility of the ordinary magisterium merit discussion: The question of infallibility is imbalanced when primary attention is given to its extraordinary exercise. The discussion of the lives of but a handful of popes, while representative of different moments in Church history, is basic, and the prominence afforded the incumbent pontiff, Francis is surprisingly and curiously limited. As a point of departure, however, this book usefully treats the chair of Peter and its occupants. First, I would like to thank John Grondelski for taking the time to read and to write this astute and excellent review of our new book on the Papacy. My first book on this subject is entitled “Upon this Rock: St. Peter and the Primacy of Rome in Scripture and the Early Church” which is also published by Ignatius Press. John gives, what I think is a very fair and balanced summary and review. Second, however, I would like to comment on a few things. First, the matter of infallibility was by Grondelski with these words, “The question of infallibility is imbalanced when primary attention is given to its extraordinary exercise.” I would suggest that this topic was addressed quite adequately considering the scope of the book. On pages 57-63, under the heading “What it Means when the Pope Teaches Infallibly” we do explain the issue of infallibility with all the various aspects covered. The review also suggests that we did not give adequate coverage of the current pope. There are three reasons we did not address Pope Francis in any detail. First, this pontificate is unusual and has been ripe with controversy. We did not feel this book was the place to open a hot topic that we would not be able to cover adequately considering the scope of our book. That is left for others with full book-length coverage. Second, it would date the book and we want this book to have a long life of explaining the papacy in general without tying it specifically to the current papacy, especially while still in the flux of time. Third, we wanted this book to transcend any particular papacy and present what might be called a “job description” of the papacy and not be about any particular pope. Having said this, I again want to thank Mr. Grondelski for his excellent review and for his service to the Church and the wider world. Thanks to National Catholic Register for carrying the review and for all the good work they do.